Praised by The New York Times for her “sublime tone,” Catherine Cho has appeared worldwide as soloist with orchestras and chamber ensembles as well as in recital. Catherine Cho’s orchestral engagements have included performances with the Detroit and National Symphony orchestras, the Virginia Symphony, the Montreal, Edmonton, and National Arts Centre Orchestras in Canada, the Korean Broadcasting Symphony, Daejon Philharmonic, and Seoul Philharmonic in Korea, the Barcelona Symphony, the Orchestra of the Teatro Colon in Buenos Aires, the New Zealand Symphony Orchestra, and the Aspen Chamber Symphony. She has toured Israel with the Haifa Symphony, and was the soloist on a concert tour in Japan and Korea with the Juilliard Orchestra and Hugh Wolff conducting. Her collaborations with distinguished conductors include Mstislav Rostropovich, Robert Spano, Sixten Ehrling, and Franz-Paul Decker. Ms. Cho’s concert performance of Vivaldi’s Four Seasons, with the Buffalo Philharmonic under the baton of Jo-Ann Falletta, was broadcast nationwide on PBS Television in January 2002. Her live recording of the Four Seasons with the Korean Chamber Ensemble was released in June 2003. She has recorded works by Harbison, Lerdahl, and Moravec for Bridge Records. As a recitalist and chamber musician, Catherine Cho has performed on the prestigious stages of Alice Tully Hall with the Chamber Music Society at New York’s Lincoln Center, the Mozarteum in Salzburg, Casals Hall in Tokyo as a member of the Casals Hall Ensemble, the Kennedy Center for the Performing Arts in Washington, D.C., the New York Metropolitan Museum of Art and the 92nd St. “Y”, the Isabella Stewart Gardner Museum of Boston, and on Ravinia’s “Rising Stars” series in Chicago. She has collaborated with pianist, Mia Chung, in performances of the complete cycle of Beethoven’s violin sonatas in the U. S. and Asia. Ms. Cho was a participant in the Marlboro Music Festival from 1993 – 2001, and has taken part in eleven “Musicians from Marlboro” national tours. Ms. Cho has performed at festivals such as Chamber Music Northwest, Bridgehampton, Eastern Shore, Rockport, Santa Fe, and Skaneateles, and has performed with the Boston Chamber Players. She is a founding member of the chamber ensemble, La Fenice, and was a member of the Johannes String Quartet from 2003-6. A winner of the Avery Fisher Career Grant, Ms. Cho won top prizes at the Montreal, Hanover, and Queen Elizabeth International Violin Competitions. She has served on the jury of international violin competitions and taught master classes worldwide. 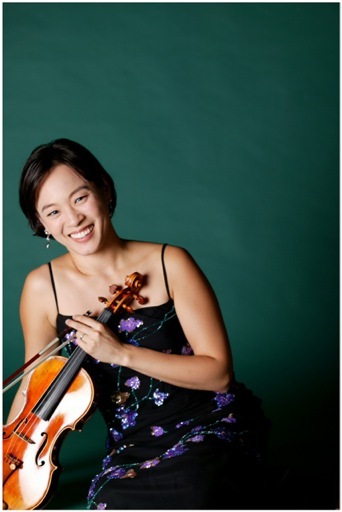 Ms. Cho is a member of the violin and chamber music faculty at the Juilliard School, and has taught at the Starling-DeLay Symposium, New York String Seminar, Killington Music Festival, Seoul Music Festival and Academy, Heifetz Institute, and the Perlman Music Program. Devoted to the cause of promoting peace through music, Catherine Cho is VP of the Board of Musicians For Harmony. She currently resides in Brooklyn, NY with her husband, Todd Phillips, and their son, Brandon. Many of the great concertos were the result of close collaboration between composer and soloist—Brahms’s collaboration with Joseph Joachim on his Violin Concerto is one of the most famous examples. In the case of Mendelssohn’s Violin Concerto his collaborator was Ferdinand David. Mendelssohn was appointed director of the Leipzig Gewandhaus orchestra in 1835 and hired David as his concertmaster, a post he held long after Mendelssohn’s death. Now that is very nice of you to press me for a violin concerto! I have the liveliest desire to write one for you, and if I have a few propitious days here I shall bring you something of the sort. But it is not an easy task. You want it to be brilliant, and how is such a one as I to manage that? The whole first solo is to consist of the high E! The audience liked it immensely and unanimously declared it one of the most beautiful pieces of this kind. Actually it meets all requirements of a concerto to the highest degree and violinists cannot thank you enough for this gift. His evaluation has held up to this day for a work that has become an indispensable superstar in the repertoire. The Violin Concerto follows the basic three-movement plan of the typical Classical concerto—fast, slow, fast—but Mendelssohn introduces several novel touches. The solo violin enters almost immediately in the first movement, rather than waiting for a traditional lengthy orchestral exposition. The location of the solo cadenza is also unusual: the composer places it just after the development instead of at the end of the recapitulation as was traditional. By giving the cadenza such structural and harmonic importance Mendelssohn makes it a more integral part of the movement. The slow movement follows the first without pause—a single held bassoon note moves upward to effect the transition to this beautiful song without words. A more impassioned central section brings a return of this sweetest of melodies, under which a bit of the agitation now lingers. Mendelssohn links the finale to the preceding Andante by a poignant transition, marked Allegretto non troppo. The wistful transition recalls the first movement’s minor key, but soon leads to the rollicking Allegro molto vivace in major. The finale’s sprightly momentum, so characteristic of Mendelssohn’s scherzos, suggests that we’ve now entered Puck’s elfin world from A Midsummer Night’s Dream. A plethora of fast notes, sprinkled with a few double, triple, and even quadruple stops (playing more than one string at a time) give the soloist ample opportunity for virtuosic display. “Lenny is New York,” quipped Yehudi Menuhin. Indeed, Bernstein saw New York City as a wonderful, teeming center of life and reflected this in many of his compositions. West Side Story springs to mind first in this regard, also depicting the serious side of life in New York; on the lighter side the Broadway show On the Town and the ballet Fancy Free both deal with three sailors on shore leave in New York. Choreographer Jerome Robbins came up with the original concept for On the Town, and Betty Comden and Adolph Green collaborated with Bernstein on the show, which was a great success when it opened in Boston on December 13, 1944, and in New York on December 28. Besides the obvious difference that the ballet and the show contain completely different music, Bernstein made a plot distinction: “On the Town was not about sailors competing. It was about three sailors with 24 hours’ shore leave in New York, period.” Each sailor goes about seeing New York and “getting a girl” in his own way. It is Bernstein’s music that lifts the work beyond the limitations of its lighthearted plot. In 1945 Bernstein put together Three Dance Episodes from the show for some orchestral concerts in 1945. The first dance episode, The Great Lover, reflects the romantic dreams of Gabey, one of the sailors. Lonely Town: Pas de deux, based on the central lyrical number of the show, presents one of Bernstein’s loveliest tunes, which describes loneliness without love in a great city. The final dance, Times Square: 1944, with its sophisticated rhythms, comes from the show’s Act I finale in which all the sailors in New York dance with gusto. Ginastera described his own creative evolution as falling into three basic periods: objective nationalism, subjective nationalism, and neo-expressionism. In his objective nationalistic compositions Ginastera presented Argentine folk materials directly and overtly, though he rarely quoted literally. His ballet Estancia represents this early period. It was commissioned in 1941 for the American Ballet Caravan by Lincoln Kirstein, who wanted a work based on Argentine country life. 1941 was a significant year for the composer—he was appointed professor of composition at the National Conservatory, was chosen chair of music at the Liceo Militar General San Martin, and married former fellow student Mercedes de Toro. Estancia was dedicated to Kirstein, but the staged production had to be postponed because the American Ballet Caravan disbanded in 1942. Nonetheless, a highly successful concert performance of the suite of dances from the ballet was given at the Teatro Colón in Buenos Aires on May 12, 1943, which won great recognition for Ginastera as a nationalistic voice. Eventually, in 1952, the work was staged, at the same theater, with choreography by Michel Borovsky. The story of the ballet involves a young man from the village who must prove himself by laboring on a large ranch (estancia) to win the love of a country girl. The Suite consists of four sections from the ballet, three from Scene 2 and the last from the fifth and final scene. The first, Los trabadores agricolas (The peasant farmers), is a vigorous dance with accented, syncopated, chordal patterns that suggest the energetic efforts of the farmers harvesting wheat. Danza del trigo (Dance of the wheat), which actually precedes the Dance of the Peasant Farmers in the complete ballet, sets the tranquil morning scene of haystacks, windmills, and wheat in the sun before just before harvest. Plaintive flute and violin solos enhance the peaceful atmosphere. The energetic rhythms return in Los peones de hacienda (The farmhands of the estate), in which the gauchos, along with the country girl, tame wild horses. Salient horn and timpani parts add to the driving quality. Danza finale (Malambo) concludes the ballet on the morning of the next day, after the young couple has shared a tender romance the previous evening. The malambo was traditionally danced by gauchos as a test of manhood—the one left standing was declared the winner. In the ballet the dance begins with introductory sparkle and picks up momentum with its accented, repetitive dance rhythms, enlivened by brass pronouncements, colorful piano glissandos (slides), occasional instrumental “cheers,” and full percussion section in which the xylophone is prominent.